Photo Story: Janhvi - Born To Be A Star! Sridevi is known to be Designer's Delight. Top Designers like Manish Malhotra used to prefer the Evergreen Beauty as showstopper for their collections as they were well aware of the value she brings. On record, Manish had rated Sridevi as the Actress with best physique to carry any outfit effortlessly. 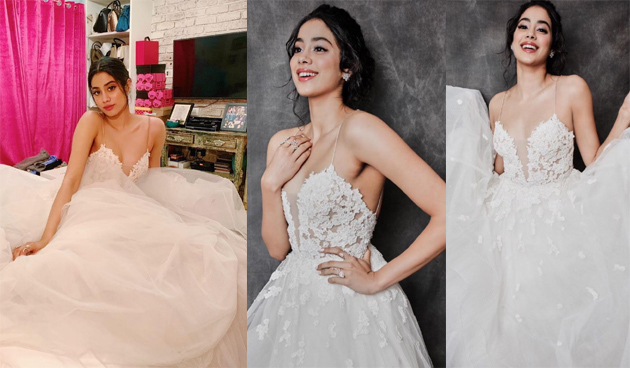 Who else other Janhvi Kapoor could match Athiloka Sundari? The 'Dhadak' Lady looked drop-dead gorgeous in the floor-length white gown she wore for the Lux Golden Rose Awards. Anyone in her age group would have appeared clueless if they were asked to wear such an outfit. Whereas, Janhvi showed how best she could enhance the designer wear with her beauty, elegance and confidence levels. #BornToBeAStar! Allu Arjun In Megastar's Sye Raa? Vijay Devarakonda Just Makes It Tough For Others!